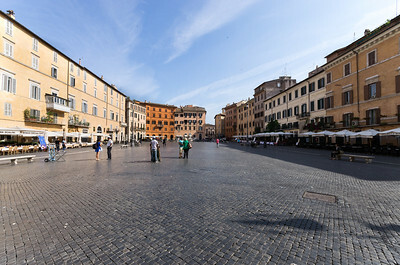 Navona Square, the most beautiful baroque square in Rome, sits on the ancient ring of the Stadium of Domitian – also known as Circus Agonalis – built in 85 AD. In the 16th century, the square was enriched with the fountains donated by Pope Gregory XIII Boncompagni, then Pope Innocent X ordered the construction of the majestic Pamphili Palace (today Brazilian embassy) on the land owned by his family. The Palace was built by Girolamo Rainaldi and embellished by marvellous frescos, a Gallery by Borromini and several art works. The Square was meant to celebrate the prestige of the Pamphili family, within a sort of competition with the Barberini and Farnese families, so Innocent X ordered the construction of the palace and the decoration of the square with very valuable works. Some pre-existing buildings were pulled down and the main architects of the time fought very hard to get the job. A very significant role in the selection of the artists was played by the powerful Donna Olimpia Maidalchini, who decided to give the job to Bernini, who had impressed her with a silver model of his fountain. 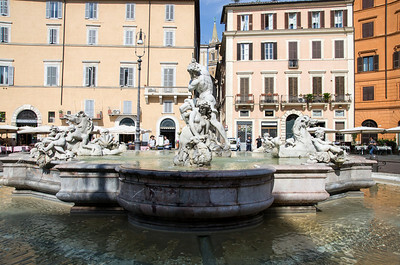 During the second half of the 17th century, Innocent X ordered the construction of a fountain in the middle of the square, giving the job to Borromini at first. 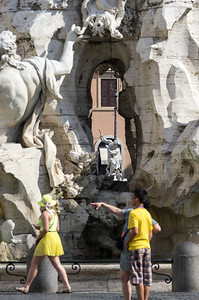 Then, the job was given to Gian Lorenzo Bernini, who enthralled the Pope with a silver model of his fountain. 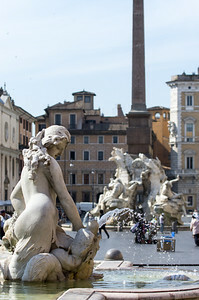 In the centre of the square can be found the largest of three fountains in the Piazza Navona, the Fontana dei Quattro Fiumi or Fountain of the Four Rivers. Constructed between 1647 and 1651, the design was first commissioned to Borromini, but was later taken over by Bernini. The fountain consists of four figures, representing the rivers, Nile, Ganges, Danube and Rio della Plata. 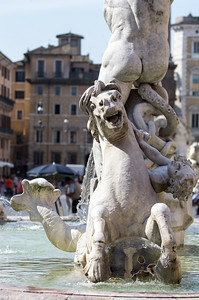 The Fontana Del Moro, or Moor Fountain, is located at the southern end of the Piazza Navona, and takes its name from the group of figures representing an Ethiopian fighting with a dolphin. 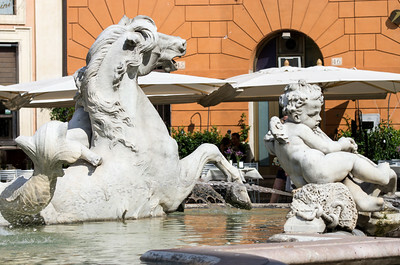 Fontana del Nettuno or Fountain of Neptune, is located at the northern end of the Piazza Navona. 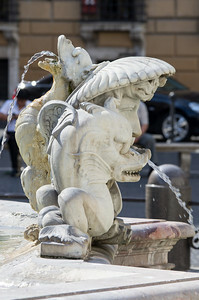 This fountain was commissioned to Giacomo della Porta in 1574, and as with the Fontana del Moro on the southern end, the material used was Portasanta, which is a rose marble. The Fountain of Neptune (Fontana del Nettuno) is one of the most famous fountains in Rome, and is located on the Piazza Navona. 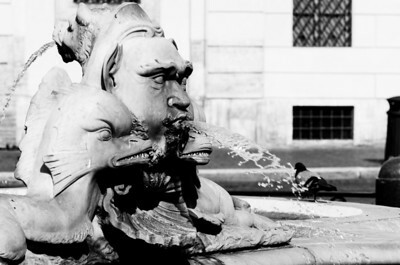 There is another fountain with the same name, in the Piazza del Popolo! First built with only a basin (which lasted for hundreds of years), the fountain was finished in 1878, by two sculptors, Antonio delle Bitta and Gregorio Zappala. 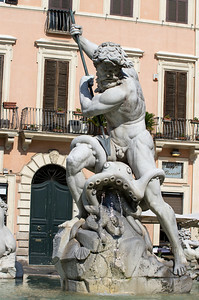 The main sculpture shows Neptune battling an octopus, and other sculptures that fit the ancient mythological theme of Nereids, cupids, and walruses. Fontana dei Quattro Fiumi The Fontana dei Quattro Fiumi or "Fountain of the Four Rivers" is a fountain in Rome, Italy, located in the urban square of the Piazza Navona. It was designed in 1651 by Gianlorenzo Bernini for Pope Innocent X whose family palace, the Palazzo Pamphili, faced onto the piazza as did the church of Sant'Agnese in Agone of which Innocent was the sponsor. The base of the fountain is a basin from the centre of which travertine rocks rise to support four river gods and above them, an ancient Egyptian obelisk surmounted with the Pamphili family emblem of a dove with an olive twig. Collectively, they represent four major rivers of the four continents through which papal authority had spread: the Nile representing Africa, the Danube representing Europe, the Ganges representing Asia, and the Rio de la Plata representing the Americas. Fontana del Moro Fontana del Moro (Moor Fountain) is a fountain located at the southern end of the Piazza Navona in Rome, Italy. It represents a Moor, or African (perhaps originally meant to be Neptune), standing in a conch shell, wrestling with a dolphin, surrounded by four Tritons. It is placed in a basin of rose-colored marble. 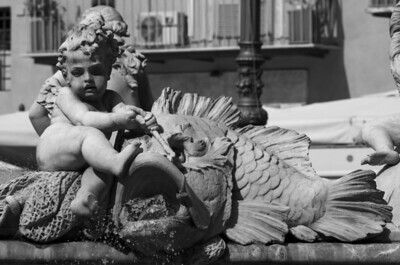 The fountain was originally designed by Giacomo della Porta in 1575 with the dolphin and four Tritons. In 1653, the statue of the Moor, by Gian Lorenzo Bernini, was added. In 1874, during a restoration of the fountain, the original statues were moved to the Galleria Borghese and replaced with copies. In 2011, the fountain was damaged after a vandal attacked it with a hammer. The vandal also damaged the Trevi Fountain that night.